The match of Hollywood against Contreras was a tough battle till the end. 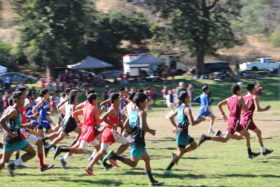 Both Cross Country boy teams were undefeated until the boy’s team lost against Cobras, 21-38. The score with the least points take home the glory of being victorious. The boys resulted in 2nd place in the league, right behind the Contrera boys. “It was a good race. [But] It doesn’t end here,” said coach Kenny Valencia. The Hollywood girls raced the Contrera girls, and had an outcome of 21-33, resulting in their loss, placing in 3rd place in their league. The team have been training for various months now and are giving their all to make their way through the top. “Going into the race we knew it would be challenging, but with that said even though we did not win, I am still proud of the outcome as many of the girls improved their times and gave it their all,” said Vivian Rodriguez.